1. Read Broadway Production, The Mountaintop, by Katori Hall. 2. Write an essay in English of no more than 300 words summarizing this Broadway play and answering the question: “Who is your favorite character in this play and why?" 3. Fill out the the online application. The evaluation of applications will be done by April 14. The applicant with the highest number of votes will be awarded a scholarship in the amount of $500.00 or more. Each scholarship will be paid directly to the scholarship recipient's college or university. The Arts with Passion’s decisions are at its sole discretion. A list of scholarship recipient(s) will be posted on https://www.theartswithpassion.com/scholarship.html around April 21. When does the scholarship application process begin and end? Applications may be submitted between 12:00 AM Central Time on January 1 and 12:00 AM Central Time on April 3. The recipient will be notified by email on or about April 21. What is the essay about? In English, compose an essay of 300 words or less summarizing the Broadway play, The Mountaintop, and answer the following questions: Who is your favorite character in this play and why? The book is available at the Public Library – Main Branch (1800 Stubbs Avenue, Monroe, LA 71202). Anyone who plans to be enrolled in a college or university by August 1 is encouraged to apply. A minimum amount of personal information is needed to verify your submission and provide The Arts with Passion with a means of contact should you become a scholarship recipient. This personal information is used for our internal records only and we will not share your personal information with any third-parties. How do I redeem a scholarship? The essay must be the sole original work of the applicant and there may be only one entry per applicant. All essays become The Arts with Passion’s property and will not be returned. Applicant warrants that the information submitted is true and verifiable, that the essay is his/her original work and that his/her nomination does not violate any law, regulation or right of any third party. Applicant warrants that his/her essay does not defame any person. By submitting an application, Applicant agrees that the essay shall become property of The Arts with Passion (including all rights embodied therein, including but not limited to the copyright) and that The Arts with Passion and its designees may exploit, reproduce, publish, use, edit, adapt and/or modify the essay in any way, in any and all media, now or hereafter known, throughout the world in perpetuity, without limitation and without additional compensation, notification or permission of Applicant or any third party. The Arts with Passion reserves the right, in its sole discretion, to cancel, modify or suspend this scholarship should virus, bugs, non-authorized human intervention or other causes beyond the control of The Arts with Passion corrupt or impair the administration, security, or fairness of the process. The Arts with Passion shall have the exclusive ability to determine whether an application complies with the Official Rules. 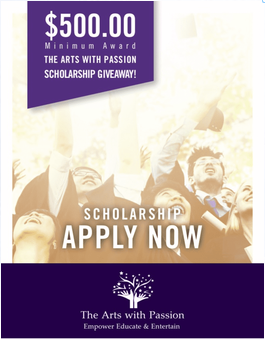 In the event the scholarship is canceled, The Arts with Passion may award scholarships using all eligible applications received up to the date of cancellation or suspension using the judging procedures outlined above. All Applicants agree to release and hold harmless The Arts with Passion from and against any and all claims or damages arising in connection with their participation. By participating, applicants agree to be bound by these Official Rules. Awards are subject to all applicable Federal, State and local laws. The invalidity or unenforceability of any provision of these Official Rules shall not affect the validity or enforceability of any other provisions. In the event that such provision is determined to be invalid or otherwise unenforceable, these rules shall be construed in accordance with their terms as if the invalid or unenforceable provision was not contained therein.